This image shows the surface of the northern hemisphere of Venus as observed by NASA's Magellan radar-mapping spacecraft, which peered through the planet's thick clouds during a mission that ended in 1994. 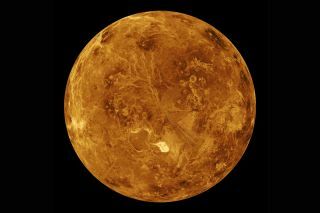 Scientists now suspect Venus may have once harbored oceans of carbon dioxide in the ancient past. Venus may have once possessed strange oceans of carbon dioxide fluid that helped shape the planet's surface, researchers say. Venus is often described as Earth's twin planet because it is the world closest to Earth in size, mass, distance and chemical makeup. However, whereas Earth is a haven for life, Venusis typically described as hellish, with a crushing atmosphere and clouds of corrosive sulfuric acid floating over a rocky desert surface hot enough to melt lead. Instead of seas of water, then, scientists now suggest that Venus might have once possessed bizarre oceans of carbon dioxide fluid. Carbon dioxide is common on Venus. "Presently, the atmosphere of Venus is mostly carbon dioxide, 96.5 percent by volume," said lead study author Dima Bolmatov, a theoretical physicist at Cornell University in Ithaca, New York.. Most familiar on Earth as a greenhouse gas that traps heat, helping warm the planet, carbon dioxide is exhaled by animals and used by plants in photosynthesis. While the substance can exist as a solid, liquid and gas, past a critical point of combined temperature and pressure, carbon dioxide can enter a "supercritical" state. Such a supercritical fluid can have properties of both liquids and gases. For example, it can dissolve materials like a liquid, but flow like a gas. To see what the effects of supercritical carbon dioxideon Venus might be, Bolmatov and his colleagues investigated the unusual properties of supercritical matter. A great deal remains uncertain about such substances, he said. The researchers found that depending on the pressure and temperature, clusters of gas-like supercritical carbon dioxide [Michael D1] might have formed in this supercritical carbon dioxide on Venus that "looked like soap bubbles," Bolmatov said. "A bubble of gas that is covered by a thick layer of liquid." Bolmatov and his colleagues said they now hope to conduct experiments to detect this shift from gaslike to liquidlike properties in supercritical carbon dioxide. The scientists detailed their findings in the Aug. 21 issue of the Journal of Physical Chemistry Letters.